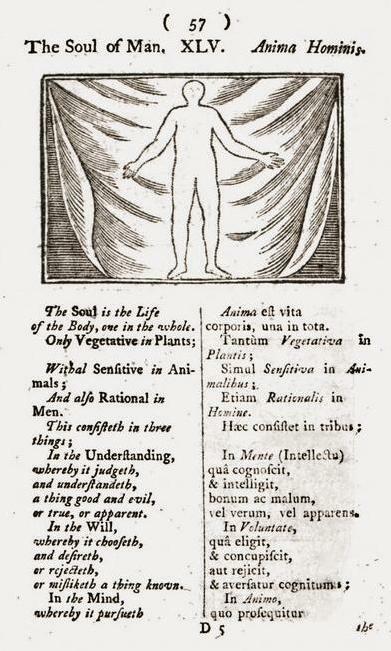 Source: Jan Comenius, Orbis sensualium pictus bilinguis. One could hardly find a better example of what philosophers often ridicule in “folk” conceptions of the soul: the soul presented in ghostly outline, as something that, being visible, could only be corporeal; and if it is corporeal, then to conceive it as spiritual is of course a mistake. Source: Jan Comenius, Orbis sensualium picti pars prima. 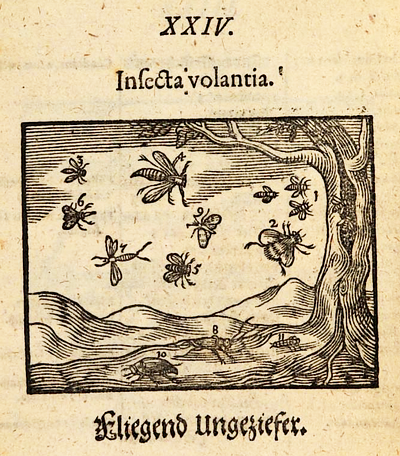 Comenius, or rather the illustrator of his text, has set himself the task of picturing all the things of this world, more precisely all the things accessible to sense (sensuales). Many things present no problem—insects, for example. Others do not lend themselves to an immediate presentation. Divine providence can be exhibited only in its effects: a man’s predestined choice between good (or its proponent, an angel) and evil (or its proponent, a demon). We might take issue with the implicit claim that providence has been pictured. 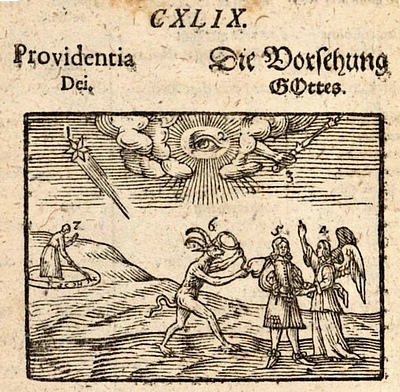 But whether or not we agree that Comenius has succeeded in picturing it, we would be ill-advised to think that the picture instances “folk theory” of providence according to which God foresees the world’s events by means of an enormous eye peeping through celestial nimbi. 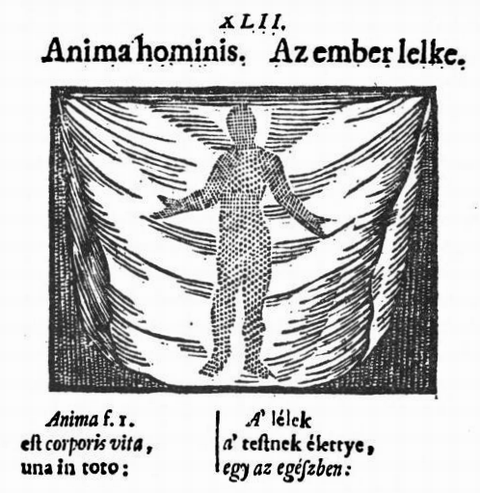 Comenius, in his Preface, writes that the pictures in his work are “of all things visible (to which invisibles are, in their own way, referred [reducuntur: see Goclenius, s.v. reductio])”. What we see is akin to what we can’t see, in ways that of course deserve to be spelled out, and are—only not in schoolbooks. trans. Charles Hoole, 12th edition (London: S. Leacroft, 1777). 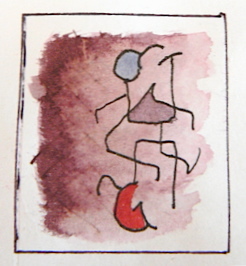 Wittgenstein says somewhere that the best picture of the human soul would be the human body. 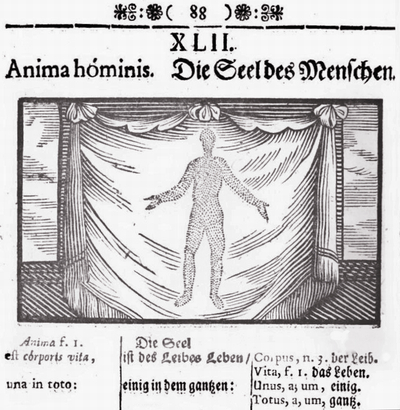 The ghostly outlines in the Orbis pictus indicate the locus of the soul’s operations. 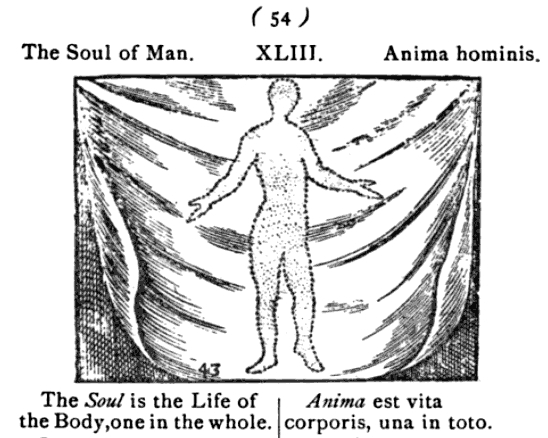 The soul is not the body itself, but the threefold life of the body, a unity of powers exercised where the body is. What is depicted is not a ghost, nor some untenably half-material, half-spiritual entity; it is the sphere of the soul’s operation.